It was 98 degrees F at 9 pm so you know summer has arrived. As my coworkers and I left the restaurant tonight we all remarked that it felt cooler than when we entered. Maybe we hit 100 today. But this morning the urban farm was nice at 6:30 am. 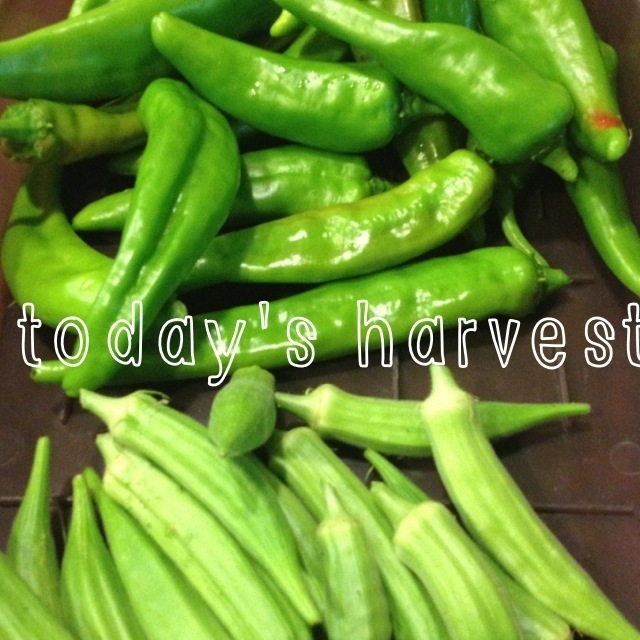 Lots of anaheim chili peppers and okra picked, with tons on the way. Looking forward to grilling these veggies tomorrow! I’m thinking of freezing some of the peppers, then pickling the next batch. Anyone have good recipes? My pal Ed has also suggested that I make some green chili pork. The Malabar spinach is already growing. It seems to like the trellises and it’s already climbing. It’s fun to watch already. It was a long work day and there will be two more this week before I’m off for 10 days. Eye is on the prize so I’ll plow through the work, head down, nose to the grindstone. This entry was posted in Sow and tagged Anaheim chilies, garden, gardening, grow, Julie Petroski, okra, sow, spinach, weather. Bookmark the permalink. It’s been beastly hot and very humid here S well, but nothing like where you are. But with humidity it’s felt like as much as 36 here. I don’t mind heat but I can’t stand humidity. Luckily today it was breezy and cool this morning. It’s going to be in the 79s every night but triple digits during the day this week. Humidity hasn’t been bad this week, but we can’t count on it being dry. Yikes! How do the Gs take the heat? Do they want to stay inside? We have a longer walk in the am. PM walk is a very shady route but much shorter than am. They love lying in the sun but we worry about their paws on the asphalt street so we try to get them to walk on the grass of neighbor’s lawns since there are no sidewalks. Our yard is very shady because of the big live oak tree, but you’re likely to find the Gs lounging on the driveway in full sun or by the garden. Guinness and George would drink. Godiva would play. We had one last year that she loved. Maybe we’ll pick one up for her this weekend. You could also put some rubber duckies in it. George would love that. Those ducks would be headless in no time! I grow lots of chillies and make chilli jam and also hot pepper sauce. I’m going to try chili jam for sure. Anaheims are great for stuffed pepper recipes! I’ll try it! Thanks for the tip.